Galatasaray Liv Hospital grabbed its second consecutive win in Top 16 Group F by rallying to edge Zalgiris Kaunas 90-83 at home on Friday. 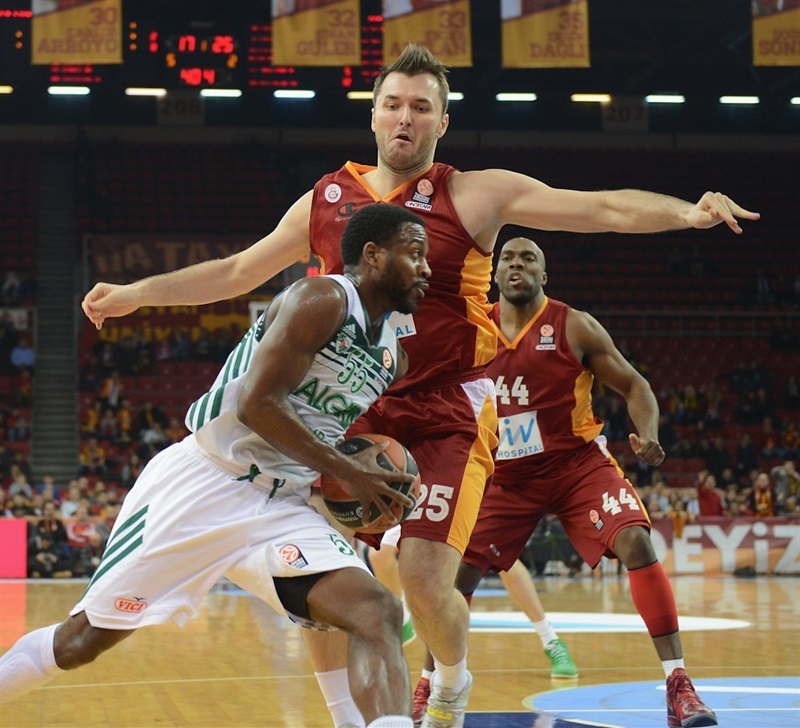 Galatasaray improved to 2-3, while Zalgiris dropped to 0-5. Carlos Arroyo led the winners with 22 points and 9 assists. Cenk Akyol had 13 points, Zoran Erceg and Ender Arslan each added 12 and Milan Macvan scored 11 for Galatasaray. Martynas Pocius and Robertas Javtokas set new personal Euroleague career highs with 26 and 21 points, respectively, for the Lithuanian champs. Javtokas hit 10 of 14 two-pointers and added 9 rebounds while Pocius hit 5 of 9 three-point shots and 5 of 6 shot from inside the arc. Paulius Jankunas added 11 points for Zalgiris, which led 12-23 after 10 minutes behind an outstanding Javtokas. Arroyo and Erceg stepped up in the second quarter and a three-pointer by Akyol gave Galatasaray a 40-35 edge at halftime. Galatasaray boosted its margin to 65-54 late in the third quarter but a rain of three-pointers by Pocius, Justin Dentmon and Arturas Milaknis brought Zalgiris as close as 80-78. Huseyin Koksal, Arroyo and Pops Mensah-Monsu stepped up in crunch time to lead Galatasaray to its first home win in this year's Top 16. Jankunas got Zalgiris going with a three-pointer from the top of the key and a layup-plus-foul by Pocius gave the guests a 0-6 lead. 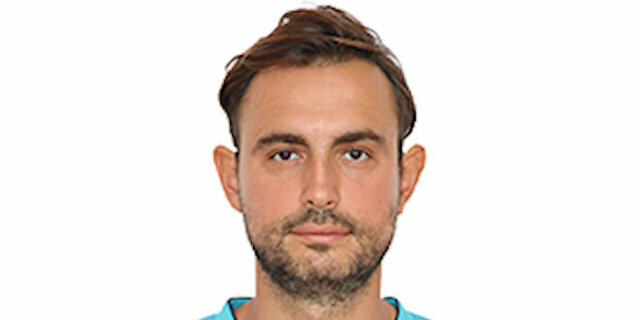 Arroyo sank a five-meter jumper and a triple by Zoran Erceg brought Galatasaray within 5-6. Vytenis Lipkevicius struck from downtown, but Arroyo matched him with free throws. Javtokas followed a backdoor layup with his trademark hook shot for an 8-13 Zalgiris edge. Koksal and Jankunas traded baskets and a layup by Javtokas boosted the guests' lead to 10-17. Javtokas kept pacing Zalgiris with a hook shot that Malik Hairston matched with a slam. Javtokas dunked and added a layup to make it a double-digit game, 12-23. Arroyo responded with a three-pointer. Ksistof Lavrinovic made free throws. A layup by Macvan kept Galatasaray within 17-25 at the end of the first quarter. 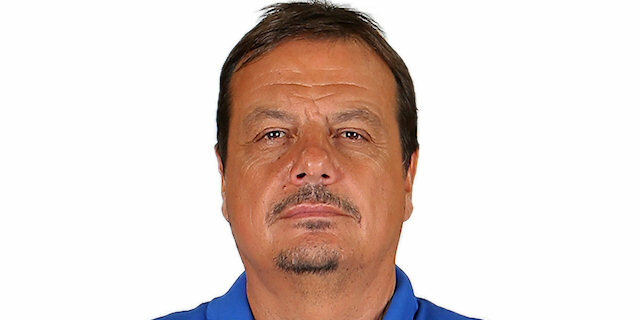 Arroyo followed a stop-and-pop jumper with a fadeaway shot, as Galatasaray improved its defense early in the second quarter. Pocius stepped up with an acrobatic basket, but Erceg took over with a three-point play that brought the hosts within 24-27. Jankunas briefly silenced the crowd with a dunk in traffic. Henry Domercant erased it with a six-meter jumper. Arroyo took over with a driving basket. Lavrinovic scored down low, but Macvan followed a tip-in with a fast break layup to give Galatasaray its first lead, 32-31. 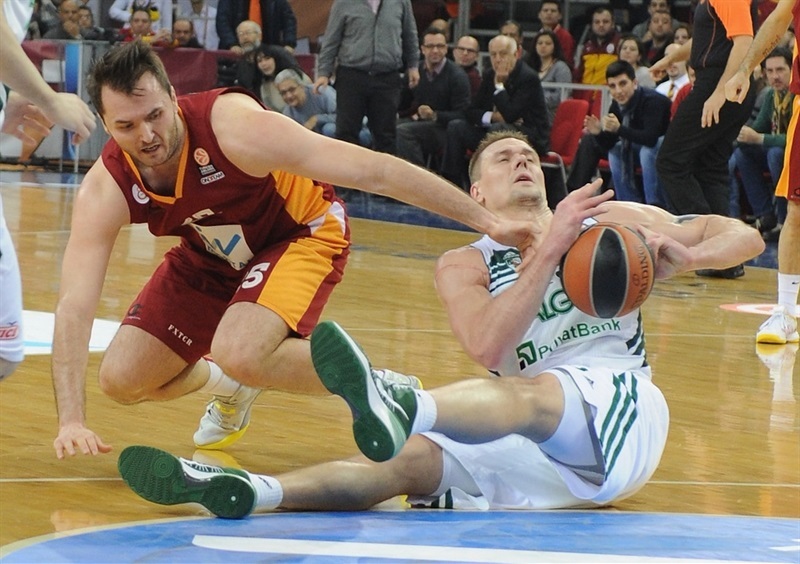 Lipkevicius scored around the basket, as Galatasaray struggled to score without Arroyo and Erceg on court. Javtokas shined with an alley-oop layup, but Arroyo returned to the court and beat the shot-clock buzzer with a rainbow jumper. Ender Arslan copied him right after that with an off-balance jumper and a three-pointer by Cenk Akyol caused Zalgiris to call timeout at 39-35. A free throw by Mensah-Bonsu fixed the halftime score at 40-35. Akyol buried a corner triple immediately after the break to cap an 11-0 Galatasaray run. Pocius stepped up with an off-balance jumper and a three-pointer by Lipkevicius brought Zalgiris within 43-40. Macvan shined with a layup in transition that Pocius bettered with a bomb from downtown. Hairston scored around the basket and a three-pointer by Erceg restored a 50-43 Galatasaray edge. Javtokas nailed an off-balance hook shot. Macvan dunked and a three-point play by Arslan boosted the hosts' lead to double digits, 55-45. Arslan kept pacing Galatasaray with a fast break layup that Javtokas matched with a put-back basket. Zalgiris improved with a very active zone defense and an alley-oop layup by Jankunas kept the guests within 57-49. After Arslan hit a jumper, Pocius scored in penetration. A triple by Erceg gave the hosts a 62-51 edge. Pocius and a red-hot Arslan traded three-pointers, but Pocius insisted from downtown to make it 65-57. Akyol hit a three-pointer early in the fourth quarter but Pocius immediately answered from downtown for a 68-60 score. Mensah-Bonsu ignited the crowd with a slam. 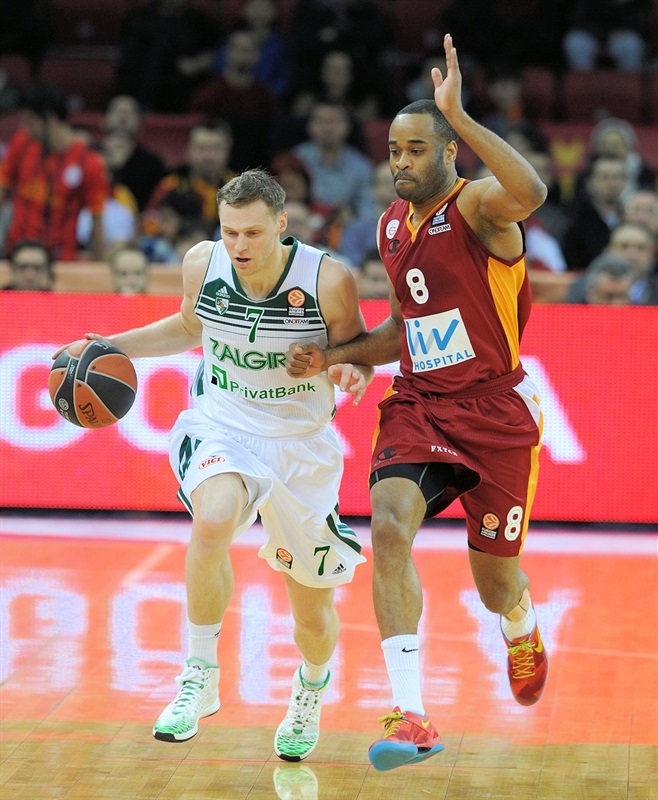 Vytenis Cizauskas split free throws and a wild alleyoop layup by an unstoppable Pocius gave Zalgiris hope at 70-63. Akyol stepped up with a put-back layup and Mensah-Bonsu took over with a wild slam, but three-pointers by Justin Dentmon - his first basket - and Arturas Milaknis brought Zalgiris even closer, 74-69. Arroyo made free throws and another triple by Dentmon made it a 4-point game. Macvan split foul shots and a jumper by Arroyo gave Galatasaray fresh air at 79-72. Pocius buried another shot from beyond the arc. Koksal split free throws and a three-pointer by Milaknis brought Zalgiris as close as 80-78 with three minutes left. Koksal answered from downtown and a floater by Arroyo forced the guests to call timeout at 85-78. A wild reverse dunk by Mensah-Bonsu allowed Galatasaray to seal the outcome, 87-79. 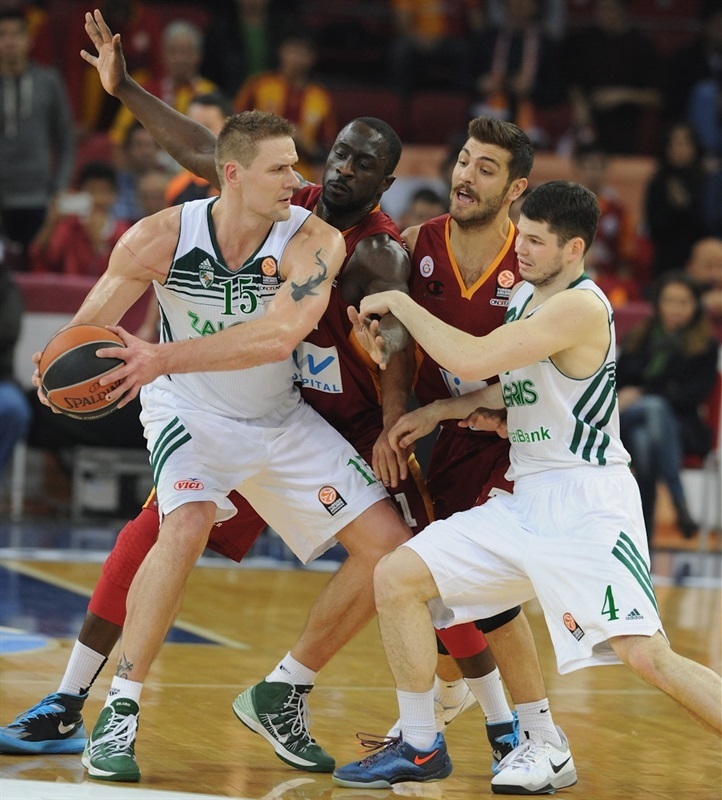 Zalgiris kept trying, but Galatasaray, pushed by an incredible crowd, cruised to a big home win. "There was a top level Euroleague game tonight. I have to congratulate everyone. We played and fought well. I also have to congratulate Zalgiris because their offense was excellent. Even though we led by 12, they managed to get in the game. Our fans created a magnificent atmosphere here in Abdi Ipekci. We played good offense and took advantage of their defensive weakness. While Zalgiris has no wins, I think they’ll get a few teams down in the Top 16. They almost beat Kuban last week, and they made a stand against us this week. I’m happy for the win in the end." "Galatasaray had a home advantage. After the first period they knew how to put pressure on us and control the game. In the second quarter our players seemed tired and we didn’t have enough players for a rotation. They scored some easy shots. We were better in the second half. We tried different defenses. However we couldn’t stop Galatasaray. When the opponent scores 90 points it’s hard to win a game. We need to defend better in future games. " "It was a game that we needed to win tonight. We were well motivated, but started with a little bit of pressure on us. But in the second period we refreshed ourselves and started to play tough. It helped us to open our offence and we took the control of the game. Zalgiris has many offensive weapons to change the destiny of the game. But we also did well to keep control of the game until the end. What we have to do now is keep winning."